How do I install and configure common options to collect SNMP data and various other data (such as system load, network link status, hard disk space, logged in users etc) into an RRD? Cacti is a network graphing tool which uses MRTG. NET-SNMP server - SNMP (Simple Network Management Protocol) is a protocol used for network management. PHP with net-snmp module - Access SNMP data using PHP. Click on "Create Graphs for this Host" link on top right side. See also Multi-CPU Utilization Graphing in Cacti. Persistent Changes – Files saved and changes made will be kept across reboots. A Backtrack 3 CDROM, Backtrack 4 DVD or an additional USB thumbdrive (minimum 2GB) – Used to partition the thumbdrive. 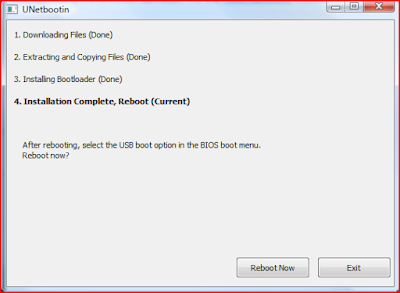 Optional: UNetbootin – A tool to transfer an iso image to a USB drive. Download the Backtrack 4 Pre Release ISO here. 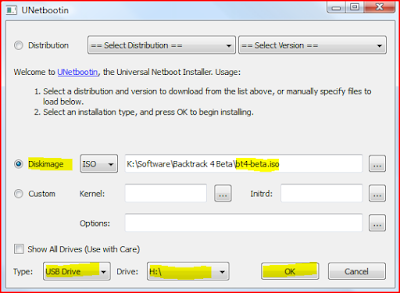 This tutorial is based on booting Backtrack 4 first. This means that you need some form of bootable Backtrack 4 media. This can be a virtual machine, DVD, or USB drive. Use your favorite method of creating a DVD or USB drive or you can use UNetBootin to create the thumb drive. 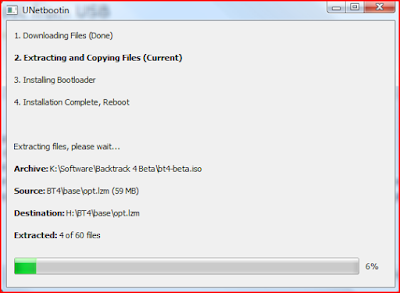 Below is a screenshot of using UnetBootin to install Backtrack 4 on a USB drive. It is as simple as selecting the image we want to write to the USB drive, the drive to write it to, and then clicking the ‘OK’ button. Warning: Make sure you pick the correct destination drive. The first partition needs to be a primary partition of at least 1.5 GB and set to type vfat. Also remember to make this partition active when you are creating it. Otherwise you might have some boot problems. The second Partition can be the rest of the thumb drive. Below are the steps to take to get the drive partitioned and formatted. These steps are taken from this video on Offensive Security website. A ‘# blah blah‘ indicates a comment and is not part of the command and user typed commands are bolded. One note, we will need to delete any existing partitions on the drive. # delete existing partitions. There may be more than one. Two things to notice above in the format commands; 1) we are using ext3 instead of ext2 and 2) you must include the -L casper-rw portion of the command. Being able to use ext3 is great because of journaling. The -L casper-rw option helps us get around the problem we had where we had to enter the partition name in order to get persistence working. As you will see, that is no longer necessary. So go ahead and partition and format the drive according the layout above. Copy the Backtrack files to it. Following are the commands to execute. Again, ‘#’ denote comments and user typed commands are in bold. # mount the first partition, sda1 in my case. # copy the files, you will need to find where the ISO is mounted on your system. That’s it. We now have a bootable Backtrack 4 USB thumb drive. Change the default boot selection to persistent. Set the resolution for our gui. To do so, do the following. Again, ‘#’ …comment….user typed…blah blah. Here is my entire menu.lst file for reference. Reboot and either select “Start Persistent Live CD” or just wait since we set it to auto-boot to persistent mode. To test it, create a file and reboot again. If your file is still there, everything is golden. Download the Ubuntu Nessus and NessusClient packages from nessus.org. The 32-bit 8.10 version worked fine for me. Again, with Backtrack 4 things are little easier. To install the Nessus server, simply execute the following command to install the package. Things used to be a little bit more complicated for the client, but with the release of the pre-final version, it is just as easy as installing as the server. Finally it’s time to configure Nessus. Execute each of the following and follow the prompts. My entries are below for fun. Nessus daemon will be able to retrieve this information. We want to disable Nessus starting at boot. We are going to do some things a little later than require that Nessus not be running at boot. This command does not remove the Nessus start scripts. It only removes the links that cause Nessus to start at boot time. The next thing we need to do is register our installation so we can get the plugin feed. You need to go here and request a key. That is a link to the free feed for home use. Use appropriately. Once you have your key. Execute the following to update your plugins. Please note that there are two dashes before register in the nessus-fetch line below. They can display as one sometimes. When that is done, and it is going to take a few minutes, you are ready to start the server and client. Be aware that with version 4.0, while the command to start returns quickly, the actual starting of the service may take a minute or two. In many cases, I have actually had to reboot before Nessus started working. You can use netstat -na to check that the server is listening on port 1241. Since we are using this tool to poke at peoples networks and systems, with permission of course, it is very important that the information we find be protected. To do this, we are going to setup an encrypted volume that will eventually become our home directory. This can be done with the gui or via command line. We will be using the gui because we need to be able to format the volume with ext3 and, as yet, I have not been able to figure out how to do that via the command line on linux. You will get a message that the volume was successful created. Click on the ‘OK’ button, then exit the Truecrypt gui, both the ‘Create Volume’ windows and the main windows. We want to be back at the command prompt at this point. The next time you reboot you will be asked for the password for the volume and it will be mounted for you. The first thing we are going to do is go ahead and configure networking to start at boot time. It’s convenient and easy to disable if we need to. All we have to do is execute the following command. The system will determine if there is anything that needs to be updated and then prompt you to continue. Individual packages can be updated by including the package name after upgrade. rsync -r –links /root/ . The next time you reboot, when you are finally in the system, your home directory will be /media/truecrypt1. That’s it. You are all done now. In this article we will describe how we can make a USB Bootable drive for Backtrack 4 Linux distribution. The new release is based on Debian/Ubuntu and not on Slackware as it was used to be in earlier versions (Backtrack 3 and below). In this article the UNetbootin Windows version tool has been used to demonstrate the above scenario. After the creation process finishes restart your machine and boot from the new usb bootable drive created and enjoy Backtrack 4 Beta on your system. Default Backtrack 4 username is root and password is toor. Note: Be sure that your install the MBR on the USB drive by executing drive:\boot\bootinst.bat on your USB drive. An Amazon Machine Image (AMI) is an encrypted machine image stored in Amazon S3. It contains all the information necessary to boot instances of your software. A type of storage that enables you to create volumes that can be mounted as devices by Amazon EC2 instances. Amazon EBS volumes behave like raw unformatted external block devices. They have user supplied device names and provide a block device interface. You can load a file system on top of Amazon EBS volumes, or use them just as you would use a block device. A distinct location within a region that is engineered to be insulated from failures in other Availability Zones and provides inexpensive, low latency network connectivity to other Availability Zones in the same region. An Amazon-generated measure that enables you to evaluate the CPU capacity of different Amazon EC2 instance types. A static public IP address designed for dynamic cloud computing. Elastic IP addresses are associated with your account, not specific instances. Any elastic IP addresses that you associate with your account remain associated with your account until you explicitly release them. Unlike traditional static IP addresses, however, elastic IP addresses allow you to mask instance or Availability Zone failures by rapidly remapping your public IP addresses to any instance in your account. Launch permission granted to a specific user. Every instance includes a fixed amount of storage space on which you can store data. This is not designed to be a permanent storage solution. If you need a permanent storage system, use Amazon EBS. A specification that defines the memory, CPU, storage capacity, and hourly cost for an instance. Some instance types are designed for standard applications while others are designed for CPU-intensive applications. a contraction of giga binary byte, a gibibyte is 2^30 bytes or 1,073,741,824 bytes. A gigabyte is 10^9 or 1,000,000,000 bytes. So yes, Amazon has bigger bytes. Once an AMI has been launched, the resulting running system is referred to as an instance. All instances based on the same AMI start out identical and any information on them is lost when the instances are terminated or fail. The disk storage associated with an instance. In the event an instance fails or is terminated (not simply rebooted), all content on the instance store is deleted. Also known as a security group, groups define firewall rules that can be shared among a group of instances that have similar security requirements. The group is specified at instance launch. Amazon EC2 instances are available for many operating platforms, including Linux, Solaris, Windows, and others. An AMI that you sell to other Amazon EC2 users. For more information, refer to the Amazon DevPay Developer Guide. All Amazon EC2 instances are assigned two IP addresses at launch: a private address (RFC 1918) and a public address that are directly mapped to each other through Network Address Translation (NAT). An AMI that all users have launch permissions for. Sets of large public data sets that can be seamlessly integrated into AWS cloud-based applications. Amazon stores the data sets at no charge to the community and, like all AWS services, users pay only for the compute and storage they use for their own applications. These data sets currently include data from the Human Genome Project, the U.S. Census, Wikipedia, and other sources. A geographical area in which you can launch instances (e.g., US, EU). A collection of instances started as part of the same launch request. An additional Amazon EC2 pricing option. With Reserved Instances, you can make a low one-time payment for each instance to reserve and receive a significant discount on the hourly usage charge for that instance. AMIs that developers build and make available for other AWS developers to use. Amazon EBS provides the ability to create snapshots or backups of your Amazon EBS volumes and store them in Amazon S3. You can use these snapshots as the starting point for new Amazon EBS volumes and to protect your data for long term durability. These AMIs are similar to paid AMIs, except that you charge for software or a service that customers use with their own AMIs. a contraction of tera binary byte, a tebibyte is 2^40 bytes or 1,099,511,627,776 bytes. A terabyte is 10^12 or 1,000,000,000,000 bytes. So yes, Amazon has bigger bytes. The Amazon Elastic Compute Cloud Command Line Tools Reference Guide provides the syntax, a description, options, and usage examples for each command line tool. This section describes who should read this guide, how the guide is organized, and other resources related to Amazon Elastic Compute Cloud. The Amazon Elastic Compute Cloud is occasionally referred to within this guide as simply "Amazon EC2"; all copyrights and legal protections still apply. Cacti is a web based PHP/MySql graphing solution using the RRDtool engine. Classically, it can graph network bandwidthes with SNMP. But in fact, a lot of different graphs can be done with snmp, shell or perl scripts. Cacti’s strength lies in the fact that it can be installed and used incredibly easily. You don’t need to be a guru or spend tons of hours on the tool to configure it. Even a beginner can use it very quickly. On the very active Cacti forum, you can share “Cacti templates” with other users which can can save you a lot of time. You can very easily add plugins to the Cacti too enabling the possiblility to integrate other free tools like ntop or php weathermap. In our opinion, this is by far the best RRDtool frontend. For details about how to use Cacti, see the very good Cacti Manual. RRDtool is a program developed by the Swiss Tobi Oeticker who was already the creator of the famous MRTG. RRDtool is developed using the “C” programming language and it stores the collected data on “.rrd” files. The number of records in a “.rrd” file never increases, meaning that old records are frequently removed. This implies that one obtains precise figures for recently logged data, whereas figures based on very old data are mean value approximations. By default, you can have daily, weekly, monthy and yearly graphs. the RRDtool records stored in .rrd files keep the same size and do not increase. You will have to configure the mysql settings through a little wizard. At the end of the tutorial, a mysql database and user named cacti will be automatically created. Now Cacti is ready to be used via: http://localhost/cacti The default login and password are admin. Cacti will check if all the required tools are correctly installed. Note that the poller.php script which send the requests to the remote hosts is lauched by the apache2 user, it means www-data. Sometimes you need to activate it the first time, then it should run automatically every 5 minutes by default. Microsoft replaced the ntbackup.exe backup utility in 2008 and Vista with wbadmin. Wbadmin enables you to back up and restore your operating system, volumes, files, folders, and applications from a command prompt. To configure a backup schedule, you must be a member of the Administrators group. To perform all other tasks with this command, you must be a member of the Backup Operators or the Administrators group, or you must have been delegated the appropriate permissions. For more information on wbadmin go to this Microsoft TechNet page. The wbadmin command replaces the ntbackup command that was released with previous versions of Windows. You cannot recover backups that you created with ntbackup by using wbadmin. However, a version of ntbackup is available as a download for Windows Server 2008 and Windows Vista users who want to recover backups that they created using ntbackup. This downloadable version of ntbackup enables you to perform recoveries only of legacy backups, and it cannot be used on computers running Windows Server 2008 or Windows Vista to create new backups. To download this version of ntbackup, see http://go.microsoft.com/fwlink/?LinkId=82917. Bucket commander is a command line tool for Amazon S3. Bucket Commander needs a configuration file, which can be created using Bucket Explorer's UI. “ -emailprofile” is optional argument , you need to specify it only when you have configured the Email profile for getting report of Bucket Commander operations (Upload, Download and Copy) via Email. To run Bucket Commander at least one credential should be saved. In case of Single credential saved the authentication argument is optional. For " -authenticate " specify the nick name that you see in "quick connect" drop down from Bucket Explorer's UI. For Bucket Commander to work it needs config folder and .Lic file, i.e. bucketcommander.xml and bucketexplorer.xml . Upload /Download/Copy details are picked from the commander xml and authentication details are picked from bucketexplorer xml. If BucketCommander.exe runs on different machines then it will not be able to decrypt credentials so it will prompt to update credentials, now you need to update credentials by giving Access Key and Secret Key . For " -emailprofile " specify the profile name that you have saved in Email profile configuration from Bucket Explorer's UI. You can specify more than one Email Profile by comma separator for getting report of Bucket Commander operations via email to each specified profile. Note: On Mac OSX you can open terminal from Applications->Utilities->Terminal in Finder. TreeSize Free - ever want to know how big various folders are? Every hard disk is too small if you just wait long enough. TreeSize Free tells you where precious space has gone. TreeSize Free can be started from the context menu of a folder or drive and shows you the size of this folder, including its subfolders. You can expand this folder in Explorer-like style and you will see the size of every subfolder. Scanning is done in a thread, so you can already see results while TreeSize Free is working. The space, which is wasted by the file system, can be displayed and the results can be printed in a report. TreeSize Free is freeware for Windows 2000/XP/Vista. Forgot your Windows NT/2k/XP/Vista admin password? Hide your computer downloads in plain sight with this UPS Hack! Pictures, movies, music, files, whatever! Nobody will even know it's there. Not your kids, your wife, a burglar - not even the... RIAA! How can I force my Linux users to change their passwords upon the first login under CentOS / Debian Linux? usermod command - Modify various user account properties including user password expiry information. -d 0 : Set the number of days since January 1st, 1970 when the password was last changed. The date may also be expressed in the format YYYY-MM-DD. By setting it to zero, you are going to force user to change password upon first login. You can perform backup operations from the command prompt or from a batch file by using the ntbackup backup command followed by various parameters. You can access only the backup option from the command prompt. To restore files, use the Backup and Restore Wizard. The following examples show how to use the ntbackup command to back up files and folders from the command line or by using a batch file. Note that if you do not specify an option, it applies the settings that you set in the graphical version of the backup program. This example creates a normal backup of the remote share \\MyServer\c$ and names it "Backup Job 1". It pulls a tape from the Backup media pool, and names the tape "Command Line Backup 1." You can substitute "Command Line Functionality" in the command with the actual description of your backup. This backup is verified after the backup job is complete. Access is not restricted to the owner or the administrator, and the logging level is set to "summary only." Remote Storage data is not backed up, and hardware compression is enabled. This example generates a copy backup of the local drive D:\ and names the backup "Backup Job 2". The backed up files and folders are added to the tape that is named "Command Line Backup 1." ntbackup backup "@C:\Program Files\Windows NT\ntbackup\data\commandline.bks" /j "Backup Job 3" /t "Command Line Backup 1" /n "Command Line Backup 2"
This example generates the type of backup that you specified in the graphical version of the Backup program. To specify the files that are backed up, this example uses the "Commandline.bks" backup selection file located in the C:\Program Files\Windows NT\Ntbackup\Data folder. The backup job is named "Backup Job 3". It overwrites the tape that is named "Command Line Backup 1" with the new name "Command Line Backup 2." ntbackup backup \\MyServer\d$ /j "Command Line Backup 4" /f "D:\backup.bkf"
ntbackup backup \\MyServer\d$ /j "Command Line Backup 6" /f "D:\backup.bkf"
The first example shows how to backup \\MyServer\d$ to the file D:\Backup.bkf. The second example shows how to append the same backup to the same file. The third example shows how to overwrite the file with the same backup. In all three examples, you can substitute a complete UNC name for the drive letter. For example, instead of d:\backup.bkf, you can use \\MyServer\d$\backup.bkf as the backup destination. All three examples use the Backup program's default values for the backup type, verification setting, logging level, hardware compression, and any other restrictions. To start the graphical version of the Backup program, click Start, point to All Programs, point to Accessories, point to System Tools, and then click Backup. Description: Specifies that you want to back up the System State data. When you select this option, the backup type will be forced to normal or copy. Description: Specifies the name of the backup selection file (.bks file) to be used for this backup operation. The at (@) character must come before the name of the backup selection file. A backup selection file contains information about the files and folders you have selected for backup. You have to create the file using the graphical user interface (GUI) version of Backup. Description: Specifies the Backup Job to be used in the backup report. The Backup Job generally describes the files and folders you are backing up in the current backup job. Description: Specifies the media pool where you want to use media. This is generally a subpool of the Backup media pool, such as 4mm DDS. If you select this you cannot use the /A, /G, /F, or /T command-line options. Description: Overwrites or appends to this tape. Do not use this switch in conjunction with /P. Description: Specifies the new tape name. You must not use /A with this switch. Description: Specifies a label for each backup set. Description: Backs up the directory service file for the specified Microsoft Exchange server. Exchange version: The /DS switch works only with Microsoft Exchange Server 5.5. The /DS switch does not work with Microsoft Exchange 2000 Server or Microsoft Exchange Server 2003. Description: Backs up the Information Store file for the specified Microsoft Exchange server. Exchange version: The /IS switch works only with Microsoft Exchange Server 5.5. The /IS switch does not work with Microsoft Exchange 2000 Server or Microsoft Exchange Server 2003. Description: Performs an append operation. Either /G or /T must be used in conjunction with this switch. Do not use this switch in conjunction with /P. Description: Verifies the data after the backup is complete. Description: Restricts access to this tape to the owner or members of the Administrators group. Description: Specifies the type of log file: f=full, s=summary, n=none (no log file is created). Description: Specifies the backup type. It must be one of the following: normal, copy, differential, incremental, or daily. Description: Backs up the migrated data files located in Remote Storage. You do not have to use the /RS command-line option to back up the local Removable Storage database (that contains the Remote Description: Storage placeholder files. When you back up the %Systemroot% folder, Backup automatically backs up the Removable Storage database also. Description: Uses hardware compression, if available, on the tape drive. Description: Specifies whether the backup must use a volume shadow copy. Note The SNAP switch is ignored in Microsoft Windows Server 2003 Service Pack 1 (SP1) and in later versions. Description: Displays help at the command prompt. Run apt-get update again and it should work. Download Flash Video using something like Video DownloadHelper (plugin for FireFox) or KeepVid. Now you have the file you want; it's time to convert the .flv file to something a little easier to work with. FFMpeg is very easy to use and can be downloaded here. Note: It may be easiest to place the .flv file in the same folder as ffmpeg.exe. In the command line enter "ffmpeg -i FILE_NAME.flv -ar 22050 NEW_FILE_NAME.mp4". This basically says "Using ffmpeg, take the file FILE_NAME.flv, change the sample rate (this is the -ar 22050 part, and it makes a world of difference to the audio quality), and output a file called NEW_FILE_NAME in the mp4 format." Instead of mp4, you could output an avi, wmv, mpg, or almost any other video file, or eve audio file like mp3. That's it. Now you have your converted video file. Save the line of code (ffmpeg -i FILE_NAME.flv -ar 22050 NEW_FILE_NAME.mp4) in a text document or text file for easy access. You can then Extract Audio from MP4 Files with AOA Audio Extractor and Remove Unnecessary Audio with Audacity if you want. Download the latest FFmpeg Windows Builds (ffmpeg.exe compiled for Windows).